Our mission at Twigly is to show how small actions can have a BIG impact. One way we’re doing that is by committing to plant up to 1,000 trees through plantabillion.org, a project of the Nature Conservancy. Ever since we first came up with the idea behind Twigly, we knew we wanted a way to bring our online presence into the real world. What better way than planting actual trees? As we continue on we’ll be running special campaigns, encouraging you to help us reach our goal. One such way is to follow us on Twitter. 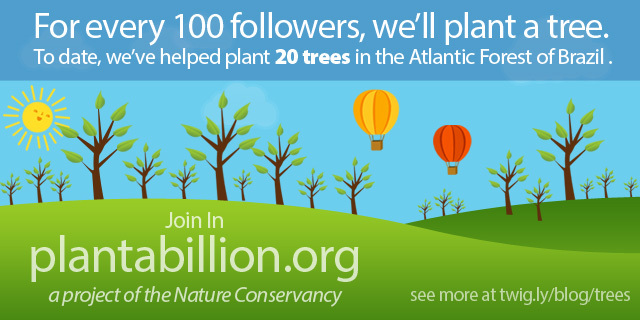 For every 100 followers to our account, we’ll plant a tree. We’ll also be running special “Tree Trivia”, as well as matching your donations during our upcoming “GROWTH” promotion. If you’d like to contribute, visit our page here.